Our last blog post was about our Market Service frontend. This time we will make a take a look into how does the management app for our cloud delivery works. Our every PHP app at its core is a composer project with OctoberCMS (or our "November" fork in case of VoIP portals) modules. We extend such a core app with php libs in form of october plugins. We store information about their git repositories in a management app we call "Mother" which keeps remote ends in sync with its internal repositories and generate zip files for various environments and also stores the plugins metadata such as prices, licenses, categories on the other. 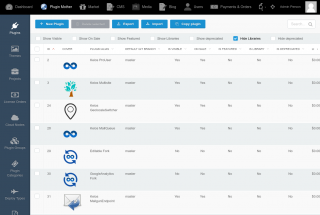 For every project, either created by customer on october-market.keios.eu we've got a an entry with set of plugins attached with metadata like project payment state or cloud node status and allows us to easily deploy our apps on Vultr or DigitalOcean. App allows us to easily deploy projects like PaymentGateway E-Commerce, VoIP portals packages, Booking app and many more from our portfolio. From the endnode of the app, its administrator can easily see the state of the app and upgrade it as required. Apps can also update their state automatically, if set. Find out more about one of many possible app frontends of this app in our previous post and feel free to leave a comment!